The BCCLA is so pleased to invite all of our members and supporters to join us for our 2015 Members’ Evening featuring Franke James, award winning artist, activist, and author of Banned on the Hill: A True Story about Dirty Oil and Government Censorship. 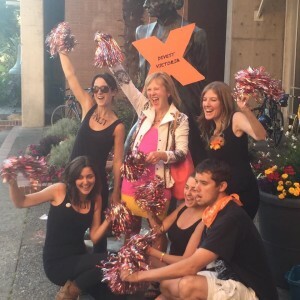 Photo: Franke James, center, with the “Radical Cheerleaders” at a rally in Victoria. We believe it is a critical moment for free expression rights in Canada. In just the last two years, cities have passed laws curtailing the right to demonstrate, scientists in employ of the government have had their voices muzzled, and ‘anti-terrorism’ laws are being used to limit our rights to free speech. Franke’s own creative work in environmental activism resulted in her work being censored by Canada’s federal government—creating a climate of fear and chilling freedom of expression. 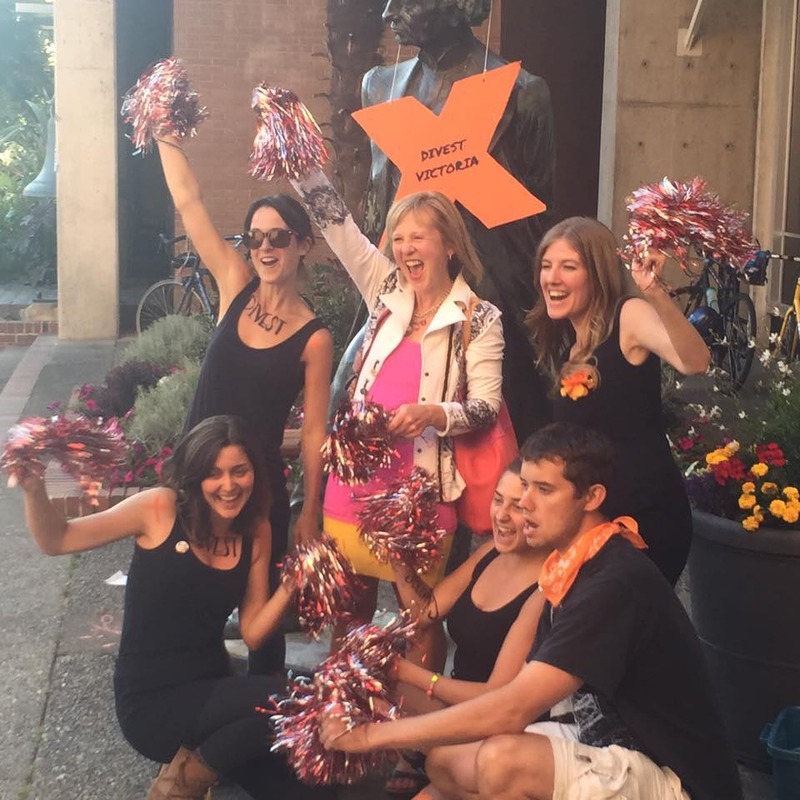 The BCCLA stands up for the rights of artists, whatever their views, to express themselves. Now, Franke is fighting back against censorship, using her art to speak up for free speech. Franke is the BCCLA Liberty Award winner for Excellence in the Arts, PEN Canada Ken Filkow Prize awardee, and one of Canada’s top eco-influencers. Will you join us for My Dangerous Art? When: Thursday, September 24th, 2015 from 7:00 pm to 9:00 pm. Who: Members and their guests! Help us build the movement for civil liberties and human rights, bring a friend or 5! 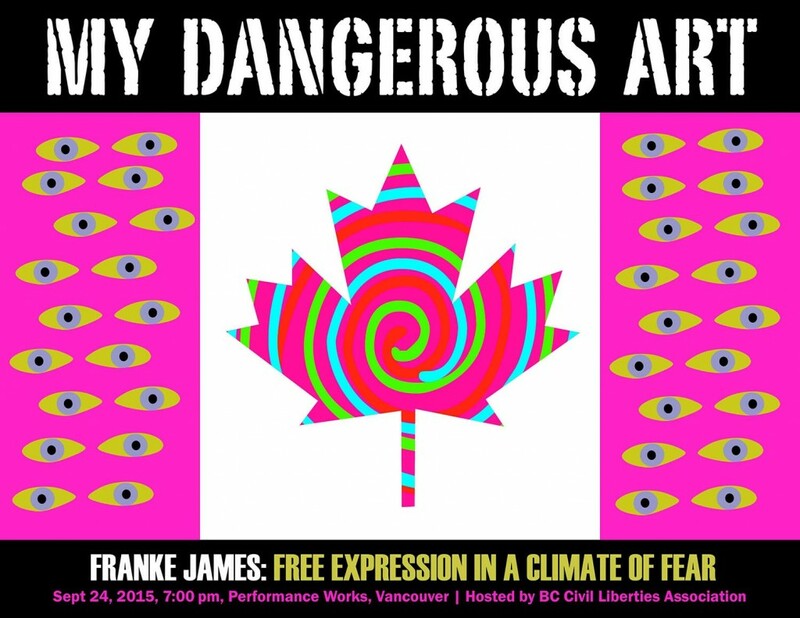 Franke James will present the story of her “dangerous art” and how Canadian officials who censored it tried to hide that they had done so. Also, included will be an exhibition of Franke’s artwork, which was posted on bus shelters in Ottawa, Calgary and Washington, DC—the perfect backdrop for mingling with other BCCLA members and engaging in discussions about freedom of expression. A cash bar and catered reception will be available for guests. This event is free of charge, and offered as an opportunity for the association to say thank you and to reconnect with our donors, members, and supporters. Due to the high number of responses, we are no longer taking RSVPs for this event. Thank you!